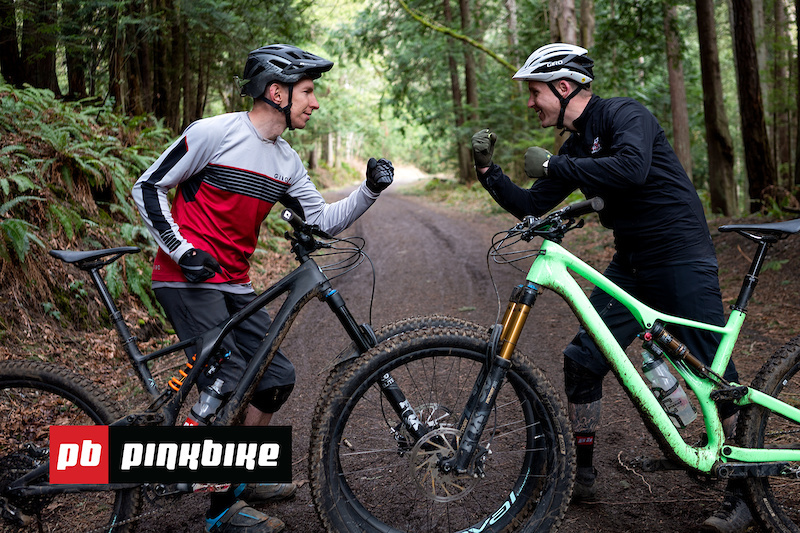 And we’re back… After an extended hiatus, it’s time for another episode of Mike vs. Mike, where we argue about mountain biking’s important (and not-so-important) topics. Up for debate this week is geometry, specifically the angles of the Specialized Stumpjumper vs. the Stumpjumper EVO. From a distance, the bikes look nearly identical, and they do both have 29” wheels and 140mm of travel out back, but the EVO model has undergone the long, low, and slack treatment, and it’s an entirely different beast than its more conservative sibling. Take the head angle, for instance; you’re looking at 66.5-degrees for the ‘regular’ Stumpjumper, and 63.5-degrees for the EVO. That’s a dramatic difference, and it’s instantly noticeable out on the trail. The EVO also has longer chainstays (443 vs. 437mm), and the reach on the S3 EVO is 475mm, compared to 445mm on a size large Stumpjumper. But is slacker always better? What about longer? What do all those numbers translate to out in the real world? Of course, personal preference is always going to play a factor, but that’s what makes geometry such a hot topic. After a riding a handful of laps on each bike, Mike Levy and I sat down to chat about our findings. What do you think? Are you in the slacker-is-alway-better camp, or do prefer your bike’s geometry to be a little less extreme? Let us know in the comments, and feel free to suggest topics for future episodes of Mike vs. Mike.